LUXEMBOURG, June 12, 2018 /PRNewswire/ -- Implementation of blockchain solutions not only lead to a reduction in bureaucracy, replace legacy systems and optimize organizational processes for business or government, but the technology behind blockchain guarantees data integrity for transactions. Moreover, the addition of smart contracts to blockchain-based technology provides for the automation of myriad day-to-day actions. However, what happens when there is an error in smart contract code or a hacker illegally takes advantage of vulnerabilities found in smart contracts? The problem is, on most blockchains, there is no way to reverse or correct errors, so the transaction data can be easily lost forever. Being implemented in e-government, for instance, blockchain solution may become a weakness in IT infrastructure and in some conditions may cause a loss of public funds. Smart laws overcome this and so is a solution, which enhances the feasibility of blockchain for any organisation. Smart laws are smart contracts that contain conditions and restrictions in accordance with normative regulations. They provide a mechanism to verify or negate whether the implementation of a smart contract contradicts the laws of the country or policies of the enterprise. In fact, they fulfill the role of legislation within blockchain ecosystems. Smart Laws are able to function in conjunction with existing regulation and allow persons with authority to correct transactions. This mechanism means mistakes can be easily corrected and stolen data can be returned to their rightful owners. Smart Laws regulate contract execution, exist within a democratic system and there is no need to fork from the chain, whilst they also introduce human logic to code. 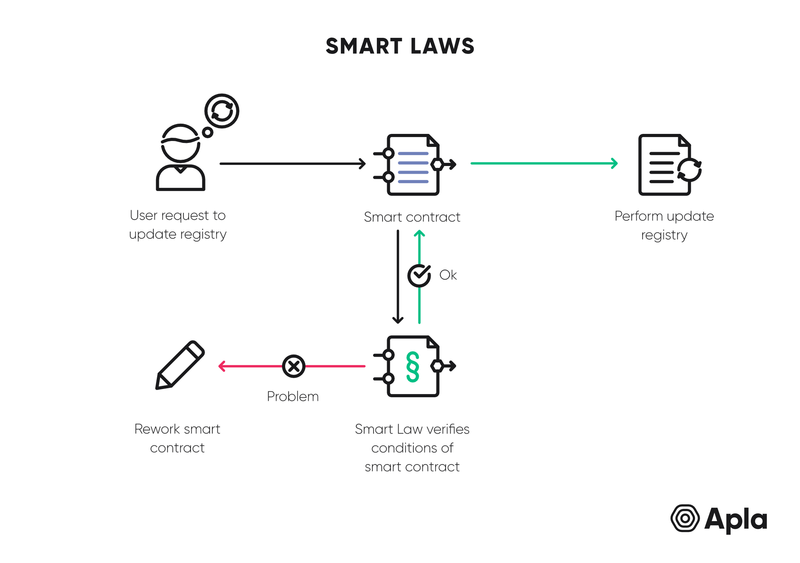 Unlike smart contracts, Smart Laws allow humans to evaluate and rectify errors where there are program contradictions or flaws in the algorithm. Smart Laws submit to a higher level of control, coming into force where an unforeseen situation (in the code) takes place, providing a system in which a person may intervene and alter the code. If a party takes advantage of an error in a contract for their own personal gain, the law will come into effect, thereby revoking the negative consequences of the unauthorized action, not by deleting a part of the register to travel back in time but to execute a series of new transactions. This solution means that the integrity of the register is not compromised since changes will take place in accordance with a contract-law, which already exists in the network at launch. The application of Smart Laws doesn't contradict the immutable nature of the register, nor its autonomy or its decentralised attributes since none of the previous entries have been altered. 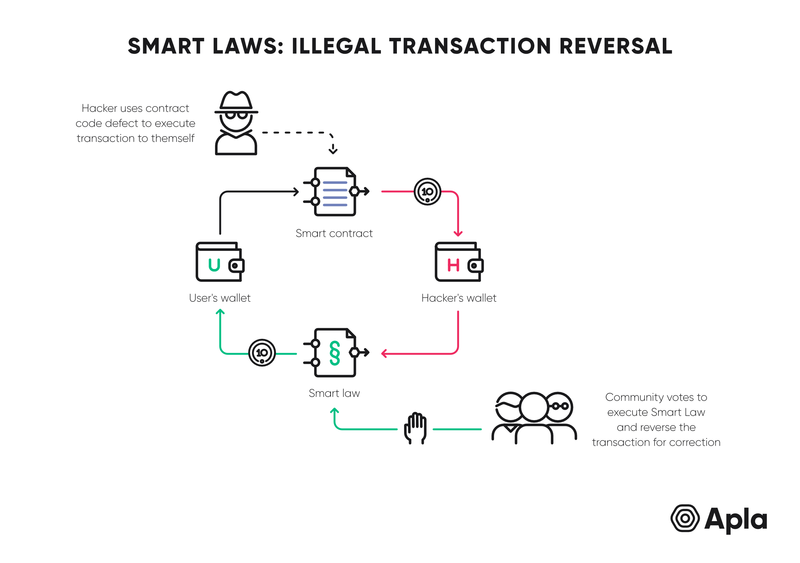 By bringing a system of law to code and creating Smart Laws built on top of smart contracts, a regulatory system is created where judicial recourse can be taken and wrongs can be put right. "Smart Laws add a new level of reliability and security to blockchain solutions. They operate above the level of protocols in blockchain, allowing to verify the existence of any licenses, permits and any other conditions necessary that were not taken into account when writing the smart contract. As such we increase the opportunities to use smart contracts for any transaction," explained Oleg Strelenko, Apla's CEO. Apla is a full-service blockchain technology company that enables governments and enterprises to work faster, safer and with greater impact. With more than 80 employees and in offices across Dubai, Luxembourg and Moscow, Apla has successfully executed projects in the UAE, India, Netherlands Antilles and Russia, with many more in the pipeline. This is a short list of proven use cases of the Apla blockchain solution: voting systems, land registries, financial services, medical records, IP rights distribution, donation and other social good marketplaces. For more information, contact Alina Nuzhnenko, Apla PR manager: alina@apla.io, +79689794229 or visit https://apla.io.